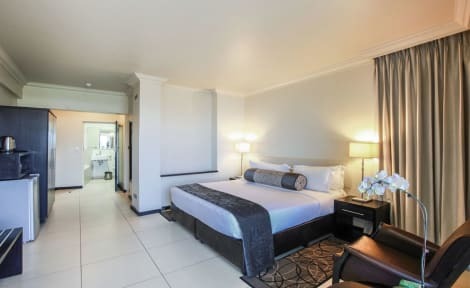 With corporate elegance, the Hilton Durban is an iconic landmark hotel offering newly renovated guest rooms in a supreme location near the Durban International Convention Center. Voted South Africa's Leading Business Hotel at the World Travel Awards from 2013 to 2018.All 328 guest rooms offer gorgeous city or coastline views. Expect the highest standard of service, impressive facilities, and dishes to suit any taste. With meeting rooms and grand ballroom space for up to 400 guests, Hilton Durban is one of the most established conference hotels in Durban. Stay connected with WiFi access and work efficiently in the business center. Executive guests can enjoy complimentary breakfast and refreshments in the stylish Business Lounge. The outdoor swimming pool and our fitness center also offer an ideal place to unwind after a busy day. Refuel at any of our 3 stylish outlets, Vasco's restaurant, serving breakfast and dinner buffets with a variety of theme nights. For light snacks and award-winning coffee, visit our Coral Lounge Café or finish your day at the Big Easy Winebar & Grill by Ernie Els. Alternatively take advantage of our 24-hour in-room dining service.These are just a few reasons why the Hilton Durban is here to make the most of your stay by offering the services you need, the amenities you expect, and the extras you deserve. Your home away from home. Make yourself at home in one of the 734 air-conditioned rooms featuring flat-screen televisions. Complimentary wireless Internet access keeps you connected, and satellite programming is available for your entertainment. Private bathrooms with showers feature designer toiletries and hair dryers. Conveniences include phones, as well as safes and desks. Make yourself at home in one of the 262 air-conditioned rooms featuring refrigerators and flat-screen televisions. Satellite television is provided for your entertainment. Bathrooms have showers and hair dryers. Conveniences include phones, as well as safes and coffee/tea makers. Offering a year-round outdoor pool and barbecue, Ibis Lodge is situated in Durban. The pet-friendly accommodation is air conditioned and has a hot tub. Moses Mabhida Stadium. Free WiFi is featured throughout the property and free private parking is available on site. Bed linen is available. Ibis Lodge also includes a terrace. Special diet menus and packed lunches are available on request. The nearest airport is King Shaka International Airport, 21 km from the property.